The sacred and holy Synod of Trent--lawfully assembled in the Holy Ghost, the same three legates of the Apostolic See presiding therein--recognising, with the blessed apostle James, that Every best gift and every perfect gift is from above, coming down from the father of lights, who, to those who ask of him wisdom, giveth to all abundantly, and upbraideth them not; and knowing withal that The fear of the Lord is the beginning of wisdom, hath ordained and decreed, that all and each of the faithful of Christ, assembled in the city of Trent, be exhorted, as they are hereby exhorted, to amend themselves of their evils and sins heretofore committed, and to walk henceforth in the fear of the Lord; not to fulfil the lusts of the flesh; to be instant in prayer; to confess more frequently; to receive the sacrament of the Eucharist; to visit churches; to fulfil, in fine, as far as each one shall be able, the commandments of the Lord; and, furthermore, to pray daily in private for peace between Christian princes, and for the unity of the Church: and as regards the bishops, and all others soever constituted in the priestly order, who are celebrating together an ecumenical council in this city, that they give heed to apply themselves assiduously to the praises of God; to offer up victims, praises, and prayers; to celebrate the sacrifice of the mass on each Sunday at least, the day whereon God made the light, rose again from the dead, and poured forth the Holy Ghost upon the disciples; making, as the same Holy Ghost enjoins by the apostle, supplications, prayers, intercessions, thanksgiving, for our most holy lord the Pope, for the emperor, for kings, and others who are placed in high stations, and for all men, that we may lead a quiet and peaceable life, may enjoy peace, and see an increase of faith. 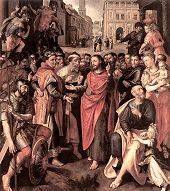 Furthermore, it exhorts that they fast at least on every Friday, in memory of the passion of the Lord, and give alms to the poor: further, on every Thursday there shall be celebrated, in the cathedral church, the mass of the Holy Ghost, with the litanies and other prayers appointed for this end; and on the same day there shall be said, in the other churches, at least the litanies and prayers; and during the time that the sacred services are being performed, let there be no talking or conversing together, but with mouth and mind association with the celebrant. And forasmuch as It behoveth bishops to be blameless, sober, chaste, ruling well their own household, (the Council) exhorts also that, above all, each observe sobriety at table, and moderation in diet; further, that, whereas idle conversations are often wont to arise there, the reading of the divine Scriptures be introduced, even at the tables of bishops; and let each teach and charge his servants not to be quarrelsome, given to wine, immodest, covetous, proud, blasphemous, and lovers of pleasures; in fine, let them shun vice and follow after virtue, and in dress, demeanour, and in all their actions show forth modesty, as becomes the servants of the servants of God.